In a decision issued June 6, 2014, the Court of Appeals for the District of Columbia, ruled that the Delaware Riverkeeper Network, the NJ Sierra Club and New Jersey Highlands Coalition were correct in their legal challenge to the Tennessee Gas Pipeline Company’s Northeast Upgrade Project and ordered additional analysis and review. The size and scope of the construction activity and stream crossings associated with this project will have a deleterious effect on the water resources of the Delaware River Basin. There are significant concerns related to the cumulative impact that continuous water body crossing pipeline construction activity has on the health and vitality of the Delaware River Basin. In addition to the NEUP, there are at least 13 other major pipeline upgrade projects that are being proposed for construction within the Delaware River Watershed. These construction projects will facilitate the further development of new natural gas wells, access roads, gathering lines, compressor stations, and other supporting infrastructure, which will further degrade the local environment. There are also numerous documented regulatory compliance failures associated with this type of pipeline construction activity. In a recent pipeline upgrade project similar in both size and scope conducted by TGP, called the 300-Line Upgrade Project, multiple violations were reported by the Conservation Districts in Pike, Wayne, and Susquehanna counties. In Pike County alone, numerous Notices of Violations were reported, including: 17 instances of dirt and sediment being discharged into water bodies, 7 violations for worksite conditions, and 21 instances of failure to properly institute Best Management Practices for erosion and sediment control. This high frequency of violations demonstrates that there were systemic and continued failures in TGP’s compliance with regulatory controls, which suggests improper oversight, and or, inadequate enforcement. In Wayne County, out of 16 inspections conducted by the County Conservation District during the 300 Line Extension Project, 15 violations were found. This startling 93% failure rate provides further evidence of systemic compliance failures. Furthermore, at the federal level, during the 300 Line Extension Project, in 28 out of 38 “Environmental Compliance Monitoring Program Weekly Summary Report[s]” that were provided on Federal Energy Regulatory Commission’s [FERC] website there was at least one recorded incident where construction activity did not come into “compliance with Project specifications, mitigation measures, and applicable FERC-approved Project plans.” Additionally, there were also at least 10 separate instances where an inspector in their “Environmental Compliance Monitoring Program Weekly Summary Report” indicated that a noncompliance report would be filed at a later date, but where the inspector failed to file a noncompliance report with FERC (and no reason was provided for the failure to issue that report in the following week’s report). These 10 separate instances indicate that either FERC has maintained incomplete records for the project, or that there were multiple failures to follow-up on potentially enforceable noncompliance matters by FERC sanctioned environmental inspectors. The Delaware River Basin has the authority to regulate pipelines construction activity that involves a “significant disturbance of ground cover” affecting water resources. Specifically, Article 3, section 2.3.5 (12) of the DRBC’s Rules of Practice and Procedures states, that the following activities are excluded from DRBC jurisdiction, “Electric transmission or bulk power system lines and appurtenances; major trunk communication lines and appurtenances; natural and manufactured gas transmission lines and appurtenances; major water transmission lines and appurtenances; unless they would pass in, on, under or across an existing or proposed reservoir or recreation project area as designated in the Comprehensive Plan; unless such lines would involve significant disturbance of ground cover affecting water resources. . . ” (emphasis added). However, up to this point the DRBC has failed to exercise its authority in this arena. In light of the regulatory compliance failures overseen by both the FERC and PADEP, the DRBC should exercise their statutory mandate to regulate pipeline construction activities in order to effectively preserve the natural integrity of the watershed. Pressure should continue to be levied against the DRBC to take such action. 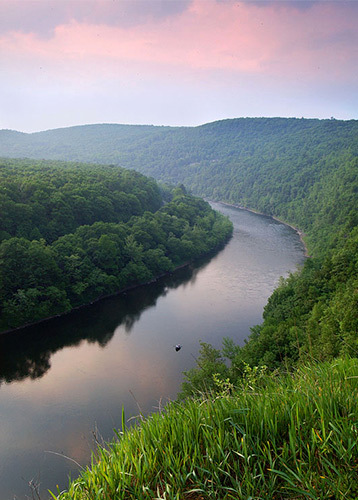 Delaware Riverkeeper Network is committed to restoring natural balance in the Delaware River and watershed where it has been lost, and ensuring preservation where it still exists. As such, we are actively engaged at the local, state, and federal government levels to ensure that full weight of legal enforcement authority is brought to bear on pipeline construction projects where operators have failed to comply with their statutory and regulatory responsibilities, and will vigorously facilitate the enforcement those regulations and permit terms and conditions where necessary. To keep abreast of the latest on this project be sure to read the Delaware Riverkeeper's Countdown blog posts. Litigation: DRN & Delaware Riverkeeper v. PA DEP & Tennessee Gas Pipeline Co.